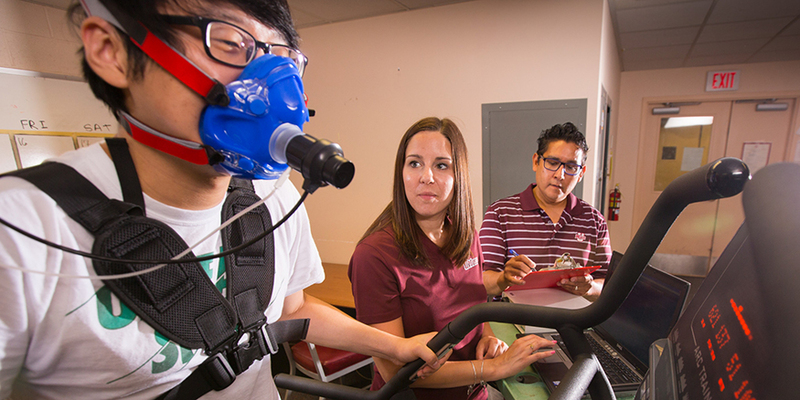 The Department of Kinesiology offers graduate programs leading to the Master of Science (M.S.) and Doctor of Philosophy (Ph.D.) degree in Kinesiology. The degree programs offer an interdisciplinary approach to the study of human physical activity, investigating the mechanical, neurological, biochemical, physiological and behavioral components of human movement. Health and well-being outcomes of exercise and physical activity are considered for a variety of populations. Our award-winning faculty has decades’ worth of experience educating students in the classroom and enabling them to develop the knowledge and competencies necessary to the study of human physical activity. Our graduate students also gain hands-on experience in research laboratory settings with faculty members conducting leading-edge research from the molecular to the community level. Faculty expertise extends to many pressing kinesiology concerns such as physical activity and health, including fitness, health and wellness, intervention, and the measurement of physical activity; motor systems, including sensory-motor control and biomechanics; and physiology, including muscle damage, cardiovascular health and recovery, muscle fatigue and aging, and energy metabolism. The University of Massachusetts Amherst Department of Kinesiology is a founding member of the American Kinesiology Association.